OTTUMWA, IA -- May 13, 2009 – At a luncheon awards presentation, the Iowa Historic Preservation Alliance (IHPA) announced their annual Preservation at its Best Awards to honor individuals, organizations, projects, and programs whose work demonstrates a commitment to excellence in historic preservation. The awards were presented as part of the Preservation in Progress: A workshop for Iowa’s preservation partners co-hosted by the IHPA, Main Street Iowa, State Historic Preservation Office and Main Street Ottumwa. About the IHPA: The Iowa Historic Preservation Alliance (IHPA) is the state-wide non-profit dedicated to the advocacy, education and creation of partnerships that enhance our economic and cultural future through the preservation of Iowa's historic resources. 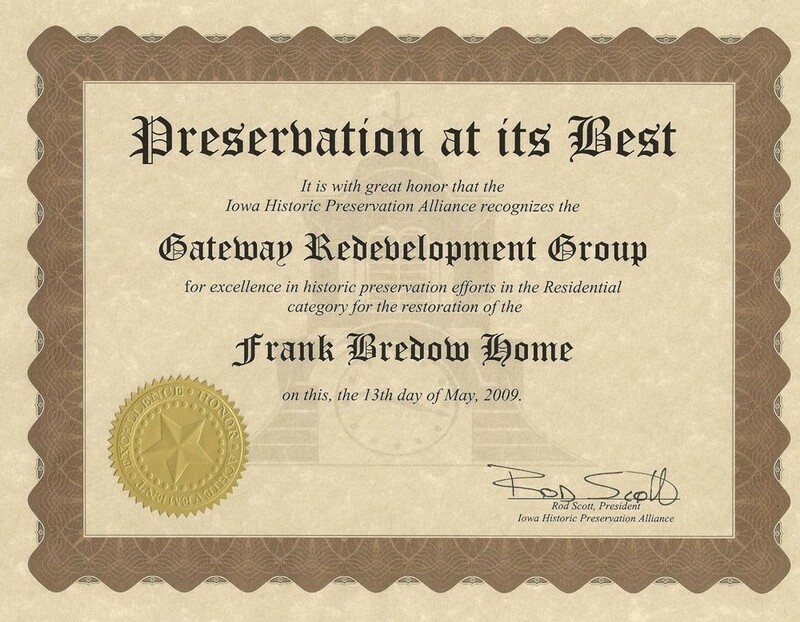 The IHPA was organized in 1991 to support, broaden and strengthen the statewide constituency for preservation in Iowa; to educated public and private policymakers who affect historic preservation issues at the national, state and local levels; to develop and implement strategies for insuring the preservation of individual and collective sites and structure of cultural significance to Iowa; and to work in partnership with national, state and local agencies and organizations whose activities impact historic resources.